L'unico difetto dell'e-book è il titolo. Anche se è quello che mi ha attratto (sic).Vale davvero molto più di molti corposi manuali di marketing stereotipati. Assume il punto di vista dell'autore che si prende le sue responsabilità rispetto al proprio lavoro.Mi piace e lo consiglio. Ah ah, mi sono divertita a leggerlo. Il passaggio da cantastorie a vendistorie è un'attività che impegna duramente e necessita della stessa passione, dedizione, estro e programmazione dell'arte dello scrivere, ma soprattutto richiede un'attività alternativa che permetta di portare a casa la pagnotta. Marketing meets Literature. And it works. Stephen Brown, a proved expert about that mushup, amazes 40k's readers with an essay that shakes wannabe writers up. He is not so kind to purer-than-pure literati and shy authors: if you want to sell your book, and you do, you should be creative in storyselling as well as you are in storytelling. If many bestsellers' authors in the history of literature could have done so, you can. Not, you must, because it is easier and much more important in a digital contest. This review originally appeared on my website. "Back in the day": a phrase often used to commemorate a sentimental time where life seemed simple and easy-to-maneuver. Of course the "Back in the day" time didn't have the joys of advanced technology, medicine (ahem: bloodletting?) and communication, but there were some parts of it that we pine after now, when the world seems much too large (almost a burden). For example, how difficult was it to be a writer "back in the day"? What was their competitive market? Four other writers? And what were their greatest concerns? Being a woman? Publish under a male pseudonym (not the greatest solution, but this is "back in the day"). Feeling like they're overstaying their welcome with whichever wealthy family is supporting them? Move on to another one. Contracted tuberculosis? Write their best material before they die. (Love you, Keats!) Oh, "Back in the day." You had it so easy. Writers in the current marketplace have a much greater problem to face. That particular conundrum is recognition - the task of spotlighting your name in an already well-lit arena. How could any new writer possibly separate (preferably elevate) their reputation for talent when there are thousands of other writers attempting the same scale (and hundreds of established writers that readers choose out of familiarity)? It's certainly daunting. And Stephen Brown has some good advice regarding it: Sell yourself. Don't be one of those elitist fools that believes their talent will draw the right people to you. It might have, "back in the day," but now? It's impossible to stand out in a crowd when you refuse to speak up. Try yelling. Essentially, selling yourself (your name, your brand) is yelling in the crowd. Other people are yelling as well, so there are additional hurdles to conquer to drown out their voices as well. Brown, however, concentrates specifically on the selling/yelling part of it. He believes that those who want to learn about selling themselves should stay away from marketing textbooks and other superfluous, weighty tomes. The easiest way to learn about marketing is to read about it in fiction. "The best insights into buying and selling and marketing and branding, and all that other awful stuff, are found in works of fiction, not in big boring anthologies or dry-as-dust academic articles." Essentially, it is easier to learn about and soak up an idea or concept when we're emotionally invested in the story behind it. We can learn to market by studying definitions or we can admire a protagonist marketer and chase this inspiration by emulating his passion and technique. Writers (or others marketing a brand) need to become businessmen to successfully sell their stories. Especially now (in our global market), but even so, "back in the day." My favorite element of Brown's ebook is his listing of various writers and their jobs; many of them surprised me. "Nick Hornby once worked for Samsung. Jeff Noon did likewise for Waterstones. Shirley Conran was the co-owner of a furniture store. Raymond Chandler was an oil company executive. T.S. Eliot was a merchant banker, ditto Stephen Leacock and P.G. Wodehouse.Wallace Stevens was in insurance, as were Franz Kafka and Anne Rice. Irvine Welsh was a property developer. Jules Verne sold stocks and bonds. Kurt Vonnegut sold second-hand cars. Edgar Rice Burroughs sold pencil sharpeners. Henry David Thoreau sold pencils. Max Barry sold peripherals for Hewlett-Packard. Henry Miller was in the apparel business. Harold Robbins ran a grocery store. L. Frank Baum was a window dresser. Both W.B. Yeats and Bram Stoker were successful theatrical managers. James Joyce started a chain of cinemas and hatched a hare-brained scheme to sell Irish tweed in Trieste. Dont ask..." Even if they didn't consciously acknowledge it, they applied their sales experience to their writing life and sold their stories successfully. "Indeed, the history of literature reveals that there's no shortage of authorpreneurs, individuals with no formal sales training but natural marketing flair." We may think that we don't need business and marketing acumen to succeed because writers (and other brands) before us didn't need it. But, in reality, the subtle affects of learned marketing experience were present "back in the day" as well. "The brutal fact of the matter, however, is that authors anti-marketing rhetoric is just that. Literary types are neither as commercially naive nor as unwilling to sell themselves as they sometimes pretend to be." So while it may seem effortless for some, we shouldn't assume that we could succeed without effort. We have the responsibility of marketing ourselves, of making our work and art appealing to the masses. There is no shame in this, even though some writers (and other brands) might feel like they cheapen their integrity by selling themselves. That shame is the ultimate hurdle (well, it's of equal height as the writer's doubt). Brown's ebook doesn't discuss all of the problems a writer faces in the current marketplace. But he does specifically target the debate about whether one needs to market their name/brand to succeed and clearly states that if you are the "effete aesthete," not willing to get your hands dirty in business, then you will be trampled by those that are. Thus: Discover your voice. Then yell. Your voice will strengthen. Continue yelling. Someone might like that voice of yours. Stephen Brown debunks the myth that great authors don't care about marketing. With an engaging writing style, he shares quirky anecdotes of authors who have successfully promoted their books, and then gives some tips for authors hoping to do the same. An engaging and helpful read. 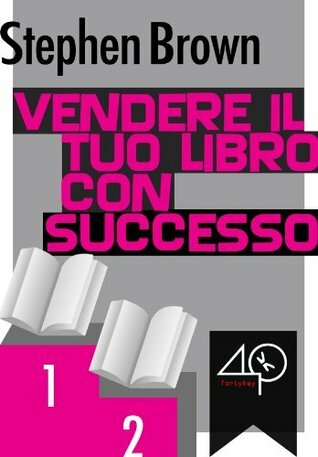 Molto meno e molto più di un manuale di marketing, Vendere il tuo libro con successo di Stephen Brown insegna agli autori come darsi una svegliata nella giungla del mercato editoriale, non grazie agli step di un self-help book, ma attraverso la storia della letteratura.Un saggio sulle nuove frontiere del marketing editoriale che ridefinisce in modo brillante e divertente il ruolo dell'autore nella promozione del proprio libro e nella costruzione di un brand autoriale. Se già in passato il coinvolgimento in prima persona dell'autore nelle attività di comunicazione del titolo poteva cambiare il destino di un'opera, nell'era del web 2.0 'sporcarsi le mani' con il marketing è un must anche per il più puro dei letterati.